these are just some of the key points I can think of, i will develop multiple information graphics to see which ones work and which ones not so much. The best one I will submitted. When coming up with the ideas i will try to showcase the key ingredients that makes up what we view as the Paralympic symbols and symbolic tones. In todays session we were given the assignment brief for this part of the course. This highlight what the project and things we have to do to make sure that we pass. Making the work to a high standard. After discussing the assignment brief ‘David’ moved the session onto typography, this is seen everywhere, it helps the audience to identify and familiarise themselves with specific language, branding and visuals. By having typography, it helps companies to sell products as it convinces the audience to buy into the brand visually and ascetically. Typography is much more complex and complicated in comparison to signs and symbols. Within this session we had a tutorial on the different ways to used simple typography in illustrator. These are some of the simple ways to add design to the ways text sits within a document and what can be done. This image showcases my knowledge on how to insert a simple text box and typing my name. also that I can change the colour of the text and add a different coloured stroke to the lettering. This is useful to know as I will have to use the text box tool a lot when designing things. I did the same things as the first image, however with this one, I then highlighted all the text right clicked and ungrouped. This meant that I could move each letter around individually. It also meant that I could play around with other tools, to change the appearance. This can look unprofessional so I would be careful to keep my designs simple but yet creative. my designs have to be audience appropriate. 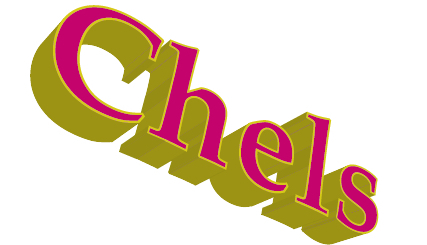 This is a 3D perspective of my name, it still has a fill colour and a stroke colour. To do this i went to the 3D settings and manipulated the angle in which we see the letters from. This In my opinion can be useful but only for specific audiences and platforms. This would work as well on a more professional basis. Out of all the tutorial this was my favourite one to change as it isn’t that complicated and there is so many options on how much or little i could change it too. This image highlights that I learned how to fill a basic shape with text this can be a very effective way to make boring text into that more digestible. This also might help to pull out important information in a design. By having this knowledge if need be I could use this technique within my own work. This can help to change the appearance of a lot of text. This also shows that i can create a shape and get text to mould to the desired shape. This is a useful thing to know as i can use this to my advantage if i wanted to text wrap around an image or another infographic. Just from this session I realise the importance of typography and how it can help to sell a product, service or person. There are so many different ways to create attractive and high quality typographic’s. i actually feel like this could be fun to learn and develop my creative skills to produce my own work. In the last session, we looked at the importance of a good design online and what makes a good design. Design is a very personal and a subjective thing, everybody has different preferences and ideologies to what makes a good design. Even though it is a person preference, there are specific fundamentals that need to be addressed in order for a design to appear professional and to a high professional standard. Design is crucial for me as a practitioner as the appearance of the content I produce will have a direct impact on my professional status. The work I produce will have to look that of a near professional standard as I don’t want to appear sloppy. By making a good design will help the content credibility and help to generate more interest. When developing an online platform, the design has to focus much more on the user experience and the appearance. When looking at an example of a bad design there where noticeable issues which would need to be amended. For instance, colour schemes. The text colour has to be readable and appropriate in accordance with the background. Colours should be limited and follow throughout all pages of website. They need to reflect the service, product or branding, this helps to keep the continuity and brand identity for the viewers. Within, the example we were shown within the image the navigation colours were red, this I would try and avoid as I wouldn’t want to exclude and miss potential business or audiences. Red text is not helpful for a number of people e.g. people with colour blindness or dyslexia as it can confuse the mind and no be suitable for them to notice or read. Also when creating my own online platforms, I will consider the uses of hover over buttons, these change the background colour to a lighter shade, so that the word is just highlighted as you hover over so you know your selection. This is simple to do and has a large impact to the professional appeal. Also it builds on the user experience as it helps the easily identify were they or on the page. Logo’s and branding is vital as it says everything about the product, brand, service etc. It has to be professional, when looking at the example shown within the session it was clear that it wasn’t of good quality. When creating my own branding/logo it will be clean, and not over designed. I can make it look unique, simple and professional by not using to many colour and no big graphics. I’ve seen lots of logos where they have over thought their logo, to me it became less appealing. In my opinion Keeping logo’s simple is best and makes all the difference to how it is viewed. If I was to create a service online I would included a phone number across the top of the page as people might just call immediately instead of searching through the whole website which will increase business. This doesn’t work on all online platforms as some industries don’t provide a service they could just be an information based website. I also believe that the visual graphics within an online platform is imperative to what the audience gains about the company or individual. Visuals attract more attention and can help to grip people into staying on that page to find out more. When deciding on images or other visuals for my work I have to make sure that it is appropriate and that it shows instantly what the web page is about. The visuals help to set the tone and they can attract or put off people. Things like taglines help to grab the audience’s attention, this could be done through questions, imperative commands and bold statements. By Using a questions, this makes people think and keeps them more engaged with the website. The use of natural language is important as I will have to consider all types of audiences ranging from multiple demographics. Depending on the wording of things it might make the audience feel like they are in charge. This can be important in some industries as you don’t want customers to feel forced into anything, this is a big part of making them feel in control. There are other ways in which make access for the audience easy. For instance, on amazon they Use call to action buttons which allows customers to interact and take control. This could be adding things into a basket or even buying a product. Call to action buttons are generally see within the trading side of online platforms. If there is a lot of writing sometimes it is best to Change the format into small chunks, this is because people who use the online platform, scan the majority of text. This will help pull out certain points that the audience may need or want to know. The audience can make more of a decision to choose to read more if something gets their attention. Line spacing can play as big part to the appearance of the page as if the text is spread out it makes it easier to read. also people scan when they are reading on-line so it doesn’t need to have loads of information. also added a footer which is simple but completes the website to give it a professional look. From this session I gained valuable knowledge that I will take into account when taking up my own online platform. Changing small parts of a website makes a massive difference, by taking into consideration all the small deal can make you site much more appealing for the viewers. The viewer will see me as a more reliable source and be more likely to come back. I want to come across as professional and be trustworthy and I want people to see good things about me. All designs are of personal preference and will depend on what type of website they are designed for. As i have missed the session, I made sure that i caught up with the tutor to find out the task. He said to sign up to INFOGR.AM and create a graph about the class. As i missed the session wasn’t to sure on what he was actually after and know very little about the group which made the task a whole lot harder. 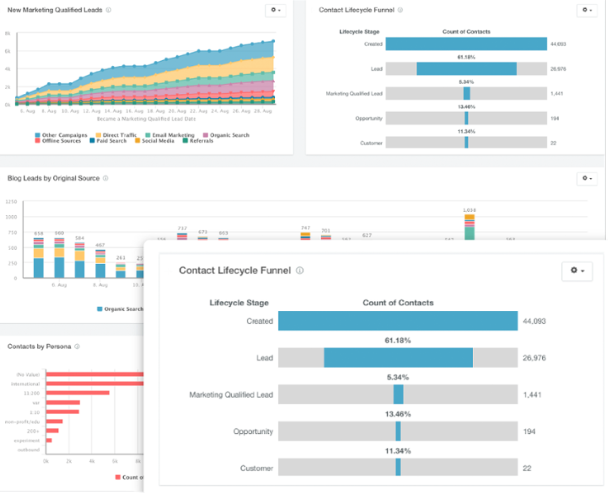 I can see why he got use to create a info graph using this tool as it is a great and fairly easy platform to change data into something much more visual. this will make the data standout more and create more of an appeal for viewers. From just spend a short time on it i thought it was an interesting way to collate data into graphs, charts, through the uses of statistics and so much more. There is also so many templates to chose from and within that you can change, add manipulate it to match the tone and purpose of the info graph. it can help me in the future as i can turn what might be a really boring topic into something much more interesting just through using visual aids. it seems to be a quick way to transform data into something visual. When i went on Infogr.am I tried to visualise some data about my class, this was very tricky as i do not know much about them. The info graph i made was fairly basic just showing the number of boys to girls in our group. i added a pie chart and title. I actually noticed i made an error when creating it as on the pie chart the colours match the wrong gender. This was a small error and easy to put right. I now understand the importance of putting in the right data in the right place. In the link below is my info graph with the error on. In a recent session we were asked to do some research into the different websites we could use to create our very own website. We were all as a group given the task to sign up to some of the popular websites. These include: Wix, Moonfruit, Weebley and Square space. The process was not difficult as I just needed to find a website which would be the best for me. For instance, had to be simply nothing to complicated, free and had to be a good platform for my online portfolio. It definitely makes a massive difference to how you express and showcase yourself online and picking a good quality platform to build it on will have a massive impact on my overall professional appearance. On the website I chose will have my portfolio on which allows me to make a statement about myself, my inspirations and aspirations. I have an opportunity to define myself as a brand, creating a visual identity in which will be identifiable to what I am about and to what my chosen topics for thoughts will be and finally will define a specific target audience I want to capture. When I created an account on Wix I found that it was simple and the interactive elements was easy to navigate around. This website is a free platform for users to start branding themselves and to create content, I find that it will be the best on to use as it looks simple and easy enough for a beginner like myself. When I login I found that I could pick a template quickly with no hassle and think it will be a good place to start off my first website. In the image below it shows, how i have used the tools to mock up a quick sample. I used all actuality image and manipulated them in Photoshop, then embedded them onto the website. I also change text, colours, size, fonts and much more. After I signed up to Wix I then went onto other websites such as Moonfruit, Weebly and Sqaure Space. I found these a lot more complex and not of my interest to use. I found them complicated even to do the basic of things and harder to navigate and change what was needed. Also it took me a lot longer to find out how to do things and the templates weren’t what I was requiring. On some of these websites a lot of things were not free meaning it could be quite costly in time, this put me off as they were harder to use and cost. If I wasn’t going to use Wix then my second option would be to use Moonfruit as it was not to my taste when originally starting out, however i think if i had more time to learn the ways around the website it then wouldn’t be so bad. As I was off from ill health after having an operation, I missed fair few sessions. As I have missed the session on learning how to embed a map into I story. I went to get the information I need to help me catch up. I was given the basics that I needed to create a map on ‘Google Maps’ and add areas on the map to show my understanding of how to do it. Embedding maps is a great visual aid when having a story which could use this to make it more interesting and visually appealing. It is a very interactive feature that can t turn a boring story into something more durable. I find maps a really useful and creative way to portray data to viewers as they have to ability to be really flexible and can showcase and highlight different places and things in all over the world. I created my own map using ‘Google map’ of different places people can visit when coming to Hull. I think this is really useful and beneficial to people who are coming to Hull on a day out and need more detail of where some good places are to go in the City centre. In the latest session with John, we discussed the importance of Visual aids to help give out data as the human mind gets turned away if there’s just loads of writing on a page. We talked about infographics. Then we were set the task of finding at least three and explain if they work well, how relevant they are and if we like or dislike it for any specific reason. In my understanding infographics, they speak louder than words, in the representation of graphs, charts and images. The ways in which you represent data is really important. It will either have an affect on the audience or they just wont take notice. Data is powerful and needs to be short, snappy, bold and should stand off the page/paper. 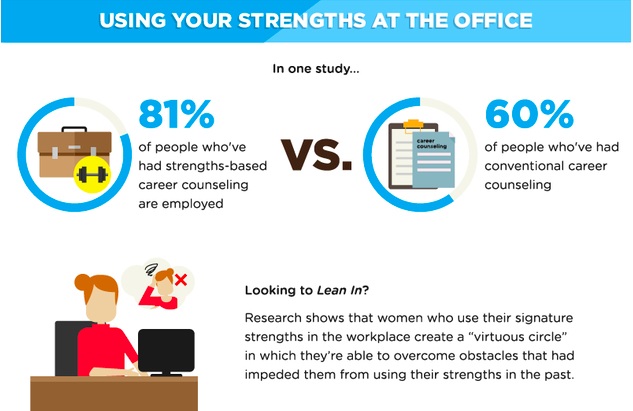 I was looking online at articles that used infographics and I came across an article on How to Use Your Character Strengths to Improve Your Life on the The Huffington Post. It was written by Rebecca Scholl, Who is the Healthy Living Intern. 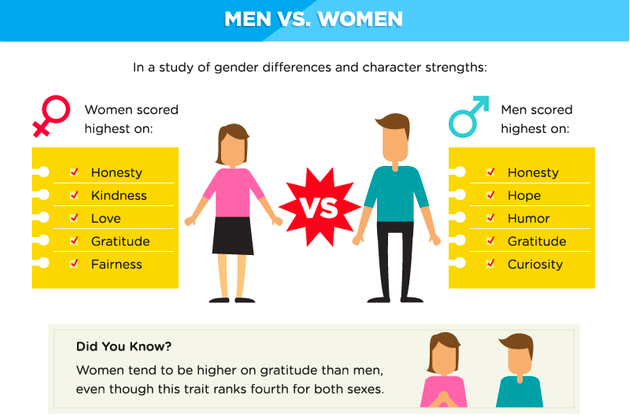 Within the article infographics are used through pictures, statistics. This is an example of the data that has been displayed. Another infographic i looked at was an important daily infographic that is seen by a large proportion of the population. 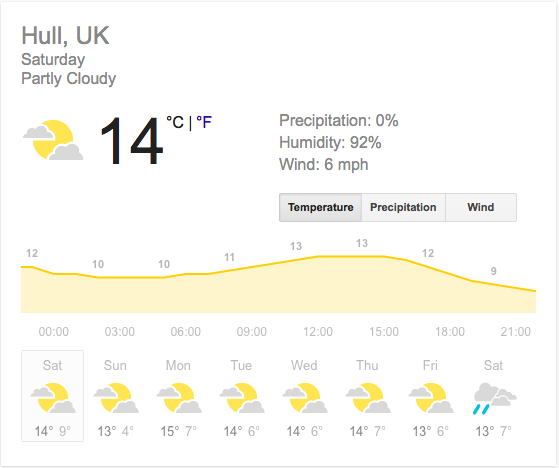 The weather forecast. in this image below it shows the expected weather for the next week, this info graphic displays the data very well as it shows exactly were, and which regions are going to be affected the best and worst by the upcoming weather. This gives out information in a very visual ways. I personally like to see this infographic as it is really identifiable, i know what I’m looking at and it gives me an insight into what is predicted for the next few day. It uses simple images, a graph and gives out useful information at the same time. for instance, wind, temperature, humidity and precipitation. finally the last one i looked at was an interactive infographic. 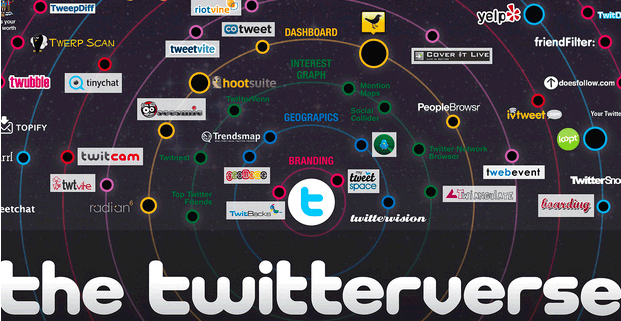 Brian Solis designed a visual depiction of the Twitter ecosystem, the Twitterverse, this was to help people learn and discover more about all the tools available on twitter. This shows so much information that people may be interested in learning around. it makes it fun and more engaging for viewers to see. Without the data being portrayed like this, people would probably not have taken an interest in the information.